Nothing deep here today. This trademark song of the 80s by Patty Donahue and The Waitresses (best known for their 1982 song, “I Know What Boys Like”) wraps up so many memories from this decade — the Pat Benatar-style new-wave singer doing a half-sing, half primitive rap about a feel-good love story that ends in a happily-ever-after. Unfortunately for the heavy-smoking Donahue, her life ended much too short, as she died of lung cancer in 1996 at age 40. This song never made it big on the charts (it peaked at no. 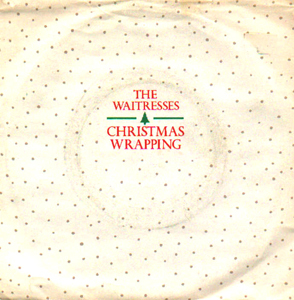 41 in 1982), but it continues to be played every year during the holiday season. This is a very personal choice, and I know it’s probably not a popular one with others who have their own countdowns. But it’s one of my “fun” songs, and I love the simple lyrics about a girl who’s done with boys and just wants to close out the world this Christmas and celebrate it alone. On Christmas Eve, she runs into a guy at the local A&P that she’s been trying to get together with all year, and they spend Christmas together. Simple. Fun. Happily Ever After, 80s style. . . .I miss it!